This hoodie oozes Maryland pride. Can you even call yourself a Marylander if you don’t wear a crab filled with OLD BAY on your chest? Constructed of a preshrunk 50/50 cotton-polyester blend, this hoodie is durable and comfy day through night. Chest is measured 1" below armhole when laid flat. 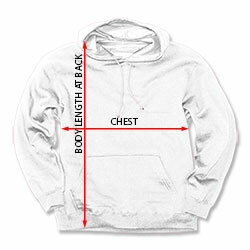 Body Length at Back is measured from the high point of the shoulder from the back of the garment.